My birthday is in about a month, and I am planning on flocking myself for the occasion. Have you ever been flocked? If you haven’t, you’re missing out! Consider “flocking” the grown-up (and I use that term loosely) version of toilet-papering your friend’s house. You get the whole “NOOOOOOO waaaaaaay!” moment in the morning when the flockee wakes up to a surprise on the lawn without the cleanup of TP. Still not following? 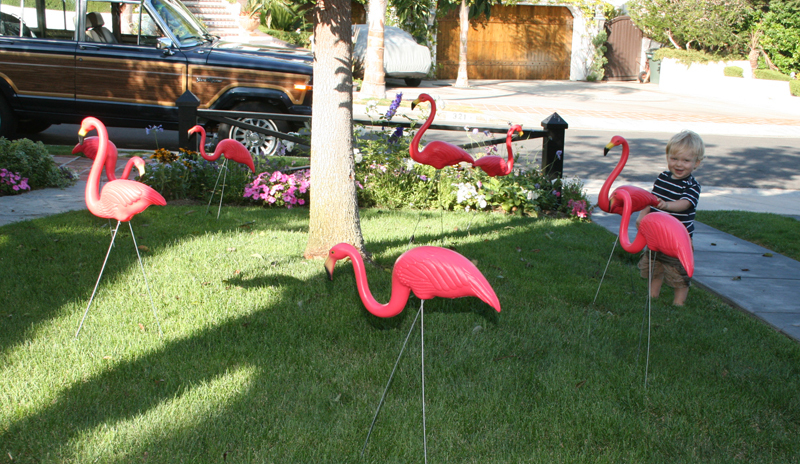 Okay… flocking is basically putting a whole bunch of plastic pink flamingos on someone’s lawn in the middle of the night. We flocked my mom for her birthday a couple years ago and the photo above was the result… kind of. My son up there kept taking the flamingos down. Anyway, you may be asking yourself: Why should I flock? Who should I flock? How do I flock? Let me help you out a bit here. Why should you flock? Well, why the heck not? I personally think it is the very best way to wake up in the morning. I wouldn’t mind a bit if I were be flocked on a daily basis. Who should you flock? Anyone and everyone. It’s particularly fun on someone you love’s birthday but really, you should never need a reason to flock! How do you flock? Now, there’s a few ways to do this. You can buy the flamingos yourself but that can be pricey and let’s face it… flamingos are hard to store. (GetFlocked.com is a great place to buy, because they are hilariously serious about the quality of their flamingos.) If you do choose to buy them, I would try to purchase at least 5 but the more the better. If you’d rather not buy or keep all these fine feathered friends, there are numerous websites that RENT a flock just for this purpose. Honestly, this is why I love life. It is someone’s business to professionally flock lawns. Does it get any better? One last tip: When flocking, especially with a small number of flamingos, keep them pretty close to each other. 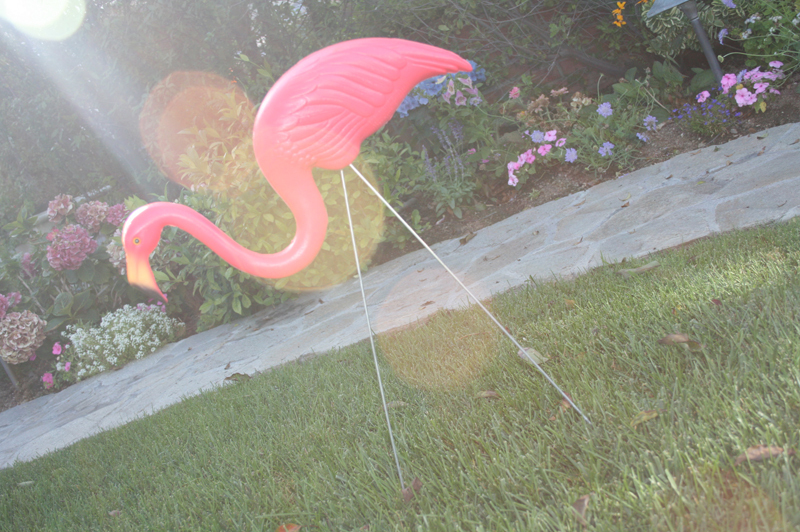 If the lawn is large, just chose a small patch and put the flamingos near each other. It will create a bigger impact that way rather than spreading them apart. So flock the birthday girl, flock your husband, flock your kids, flock your neighbor. Once you flock, you can’t stop. This entry was posted in how to's and tagged flock a lawn, flock the birthday girl, flocking flamingos, flocking yard, pink flamingos, plastic flamingo by Annika. Bookmark the permalink. 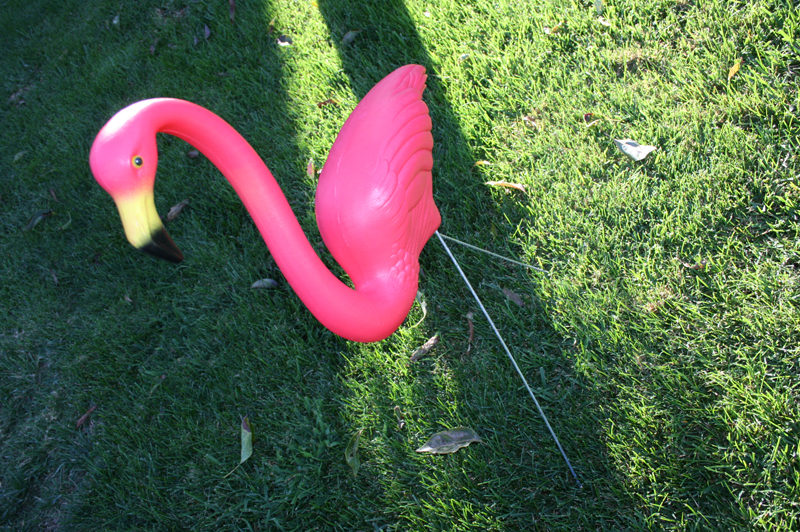 Annika…You are soo right, it is so much fun to wake up on your birthday morning and see a flock of flamingos on your lawn. A group of friends of mine in So. Pas. have it down to a science…we have a list of birthday “Flamingals” taped to a big trash can filled with all of the flamingos, and after you have been flocked on your birthday, you pay it forward to the next person on the list. We have been doing it for about 4 years and it never fails to brighten up a birthday! We even have cute Flamingal T shirts!! LOVE this idea!! So funny!! Definitely thieving this one.